“The Ministry of ICT through the National Information Technology Authority (NITA) should be the Secretariat and house the National Databank for the rest of the other departments that may need specific information,” reads the April 2, 2009 letter to then Internal Affairs Minister Kirunda Kivejinja. Following the directive, technocrats and some MPs have been on collision over the matter culminating into last week’s parliamentary debate on the matter. The ID project that has dragged on for close to seven years now is shrouded in controversy. The Inspectorate of Government halted the procurement process in 2005 and issued a report several months later, implicating ministers and senior government officials for alleged corruption and influence peddling in awarding the contract to a South African firm- Face Technology. A second attempt saw government handpicked a German firm, Muhlbauer Technology Group. The project has, however, lately been in the news after reports that the firm, contracted in March 2010, had taken billions but so far produced only 400 IDs instead of the expected 3.5 million by December 2010 and the rest by June next year when the project was expected to end. MPs led by Michael Mawanda (Igara East, NRM) have told the media that the ID project was illegally taken to the Ministry of Internal Affairs and fronted as a security matter in order to steal public funds. However, our investigation reveals that some MPs were pushing for the ID secretariat to be shifted to NITA in violation of the existing laws. Accordingly to our investigations, those pushing for the transfer of the National Identification Register from the Ministry of Internal Affairs to ICT include MP Igeme Nabeta, the chairman of the parliamentary committee on ICT. Apparently, NITA is pushing for the ID secretariat basing on article 5(c) of its Act which says one of its functions is to create and manage the national data bank, its iputs and outputs. But the Act does not mention printing of national IDs as one of the functions of the NITA secretariat. “We are to play a role in this with the recommendation of the President. All we are saying is that technical aspects of the project come under IT and we are to work with Internal Affairs to ensure proper governance of the project,” Mr James Saaka, the executive director of NITA, said. Asked why NITA would be interested in the governance of a project under a different institution and outside its mandate, Mr Saaka said: “We want to make sure that this project moves smoothly.” Also bogging down the project is lack of funding by the government to Internal Affairs ministry. The IGG then recommended that the Internal Affairs ministry be facilitated to enable it undertake the project. Government is yet to act on the recommendation. The IGG’s report also states that: “The Uganda Citizenship & Immigration Control Act does not provide for the Board to delegate its functions to third parties and neither does it provide for third parties to perform the statutory functions of the Board. Sources, however, say out of the five million voters registered by the EC, immigration officials discovered that only 1.5 million would qualify to be Ugandans. 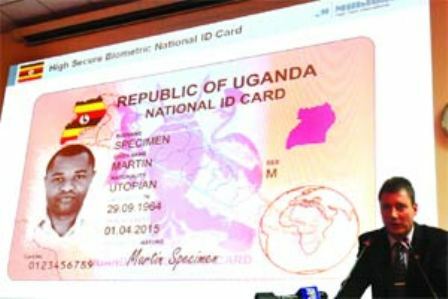 Apparently, the EC data captured many foreigners as Ugandans.